The vireo family is a group of exclusively New-World birds, mostly residing in the Nearctic and tropics. Most species in the four genera are found in northern South America, Central America or Mexico, and most are non-migratory. 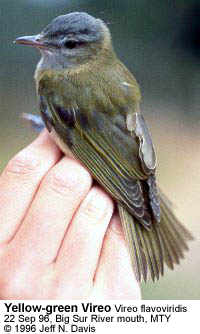 A handful of species, in the genus Vireo, migrate into the United States during the breeding season. The species breeding in North America are the most familiar. But these migrants comprise only a subset of the vireo family. In general, vireos are rather small, nondescript , mostly yellowish or greenish with varying amounts of gray, black or white. Most rely primarily on insects and arthropods for food, and incessantly search dense foliage in various layers for food. As if to compensate for a crypic lifestyle and cryptic habitat, many species of vireos are notable for their vocal complexity. Most species have repertoires consisting of many songs, ranging from about a dozen to over 100 in some species. Many are persistent singers, delivering songs throughout the day. A number of species show contextual variation in their delivery of songs. The vireo family has a number of species that are good choices for studies of vocal communication, and the varity of vocal behaviors seen/heard offers considerable opportunity for studies of function and evolution of vocal signals. The nesting behavior and chronology are known primarily from the species that breed in The United States and Canada. The behavior and nesting of the nonmigratory species, especially the greenlets, are very poorly known. They are all very cryptic and secretive, and difficult to study. The vireos all build what is called a pensive nest, which is attached to branches and hangs below. After their arrival on the breeding grounds in the spring, pairs form quickly and the birds soon begin by selecting a nest site. This is usually a small horizontal "Y"-shaped branch, just about the size you can form by spreading out your index and middle fingers into a "Y". The size is carefully chosen, usually by the female, who can be seen perching on likely "Y" branches and pivoting as if to size up the spot. Different species nest at different heights, with Bell's and White-eyed vireos nesting just a few feet off the ground, and Red-eyed and Philadelphia vireos usually nesting high in trees. The pair begins by collecting spider and silkworm webbing, packing into a loose nest blob at the site. As it takes shape, the female begins to form a cup by using her body, sitting in/on the material. As it takes shape, the pair starts to add plant matter including bark fragments, grass, moss, paper from wasp nests and the like. After about a week of work, the final step is to line the nest with fine grass, rootlets, and animal hair. In some species both parents help with the nest, in others, only the female. After building, the female lays one egg per day, usually in early morning, until all are laid, usually 3 or 4. The pair takes turns incubating the eggs for about 12-14 days, and feed the nestlings a variety of insects for about 9-11 days. When the birds leave the nest, they are not very good fliers, but can scramble quite effectively in scrubby growth. The parents continue to feed the fledglings for up to three weeks. After the first nest of the season, the pair usually resets and nests a second, or even perhaps a third time. Most of the nests in any given year are unsuccessful, falling prey to any of the many predators who find the tiny sitting-duck (or rather sitting vireo) eggs or nestlings a nice high-protein meal. Nest predators include snakes and lizards, both small and larger mammals, including racoons, skunks, chipmunks and mice, and oppossums, other birds such as jays, and even ants. 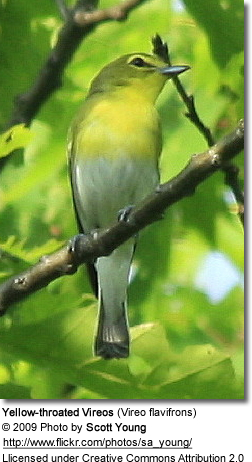 The vireos are also the frequent target of cowbirds, who lay their eggs in other species' nests. The cowbird eggs hatch before the vireos and the parents begin feeding those young. The neglected vireo eggs then usually don't hatch. Over the course of the summer the young vireos become more independent, and eventually wander off on their own. The adults and young migrate separately. The birds then migrate to their wintering grounds, and return to the breeding grounds the following spring, to an available area suitable for their habitat needs. They find a mate, and the cycle begins again. The family can roughly be divided into three groups: namely the true vireos (genus Vireo), the greenlets (genus Hylophilus), and the peppershrikes and shrike-vireos (genera Cyclarhis and Vireolanius). The several species that nest in North America are in the vireo genus; the other two groups have no representatives north of the Mexican/United States border. The Vireo genus can be further divided on the basis of plumage morphology into those with wingbars and eye-rings (e.g. V. griseus and solitarius) and those with plain wings and eye stripes (e.g. V. olivaceus and gilvus). Alternatively, the vireo genus might be divided behaviorally on the basis of those species that tend toward arboreal habits (e.g. V. olivaceus and solitarius) and those that inhabit scrubby or successional growth (e.g. V. griseus and V. bellii). Genus Cyclarhis, the Peppershrikes : The Peppershrikes are found in tropical Central and South America. They form the genus Cyclarhis. These are heavyset birds with a hooked shrike-like bill. The are sluggish, and, although very vocal, they are hard to see as they feeds on insects and spiders high in the foliage. The nest is a cup high in a tree.